The dreams of an aspiring musician, interrupted by Immigration and Customs Enforcement, is the basis for a new film opening in May at the Los Angeles Asian Pacific Film Festival. Staring Eva Noblezada, Princess Punzalan, and Tony-winner Lea Salonga, “Yellow Rose” tells the story of Rose Garcia, a 17-year-old Filipino American girl from Texas who secretly dreams of becoming a country music star. When her mom is arrested by immigration agents, Rose runs away and is forced to embark on a journey to forge her own path or face deportation with her mother back to the Philippines. 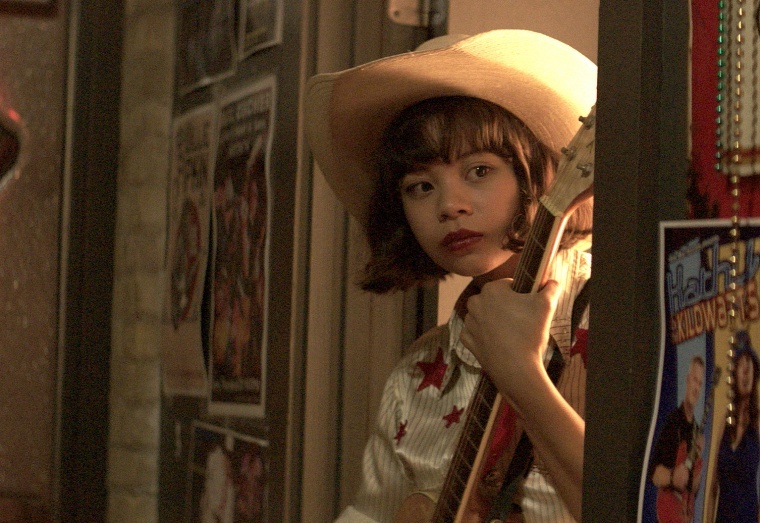 The film features original music composed and performed by the cast and director Diane Paragas, who said she took her inspiration from 1960s and ‘70s country music stars — like Loretta Lynn, Patsy Cline and Willie Nelson — in an effort to create a protagonist immersed in Austin’s music scene. Inspired by her own upbringing in the heart of Texas, Paragas wanted to make a film with her hometown of Austin as the setting and spent 15 years developing the movie. In 2014, Paragas released a short version of “Yellow Rose” with the intent of expanding it to a feature film. While casting for the feature, Paragas said she had her eye on Noblezada, who was performing in London in the West End production of “Miss Saigon” at the time. When Noblezada came to New York for the Broadway production of “Miss Saigon,” Paragas scheduled a meeting with her after one of her shows and offered her the role on the spot, adding that she would be willing to wait for “Miss Saigon” to finish its run. “When you cast people that come from theater, which is big, you wonder if they can transition into film acting, which is more nuanced,” Paragas said. “Eva had this unusual cinematic style of acting on stage that is rare in musical theater. There’s something really special about her. Beyond her voice, she’s just an extraordinary charming natural actress." Paragas had a previous connection with Salonga because they had worked together on a documentary in the Philippines. Paragas said when Salonga read the script, she immediately said yes. Paragas added that representation of Filipino Americans was important to her in order to tell this story. “As a Filipina American, I feel like we are mostly invisible as a subset of Asian Americans. Filipinos have played other Asians, but you rarely see a Filipino being a Filipino," she said. Jeremiah Abraham, the film's co-producer and publicist, said while “Yellow Rose” is a story centered on Filipinos, they hope to encompass a reality that many Americans are currently facing. A media guide compiled by Define American, a nonprofit whose work aims to inform conversations about immigration in the U.S., reported that when it comes to telling stories about undocumented immigrants, the focus had been on Mexicans, although Asians continue to be the fastest growing undocumented immigrant population. “Our hope is to help diversify the types of stories being told about Asian Americans in Hollywood and the value we can bring to mainstream media,” Abraham said. According to the Pew Research Center, Asian immigrants in the U.S. make up 13 percent of the undocumented population. But representation of that population in mainstream media is still rare, according to groups like Define American. For Paragas, she hopes not only to bring Asian immigrant stories to the forefront, but she wanted to create a story that people could relate to. “One of the great, powerful things about cinema is that it can tell a relatable human story that helps inform what’s going on in the news,” Paragas said. “If you can come to love these characters, it’s the universal humanity that will give some empathy and shed light on certain issues like immigration that feel divisive but shouldn’t be.